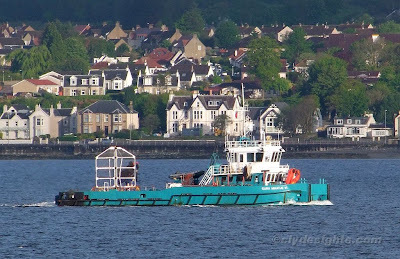 Although owned by a Dutch company, Acta Marine, SARA MAATJE VI is on long-term charter to the MoD and is now managed by Serco Denholm. She was built in the Netherlands in 1986 as ZUS, renamed SARA MAATJE VI in 1990, and in 1993 was lengthened from 26.8 metres to 31 metres. A further rebuild followed, more extensive this time, in 1998 and she was lengthened again to 32.4 metres and also widened from 6 metres to 10 metres. Built with twin screws, the additional width allowed modification to her propulsion too, and SARA MAATJE VI is now a triple screw vessel. She has been used at the BUTEC range near Kyle of Lochalsh since 2001.